This is the second post of our series of projects to make us thankful for DIY. Be sure to check back everyday during the month of November for new simple and easy DIY projects. Today I'd like to share a recent project that came about by necessity. We had a two fold problem. First, we have two large pine trees in the back of our property and have a never ending supply of pine needles dropping in places known and unknown. At some point we realized that the lawnmower with the bag attachment mulches these pine needles in short order. Over the course of an afternoon we accumulated several bags and carried them to a bed that needed some help. This particular bed has had a major problem with both weeds and soaring temperatures because it faces the south side of our house. This last summer we tried growing Pepper Plants as they are very heat tolerant. Bell pepper plants love heat yes but. even they have their breaking point. The surface temps we have recorded in the past has been in excess of 120 degrees. 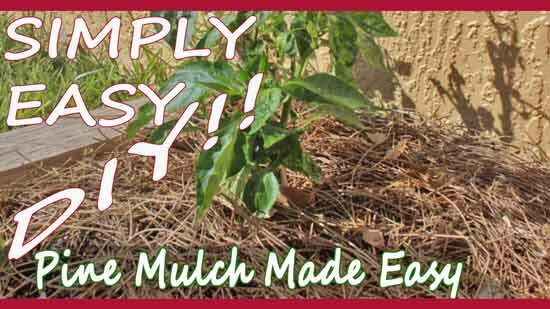 The soil dries out within hours even with a generous supply of peat moss added. So in order to try and combat the moisture loss problem, in came the mulched pine needles. So after we weeded, fertilized and laid the pine mulch, we noticed a considerable improvement in weed reduction and cooler temps near the roots. So hopefully our plants will have a second chance. We'll let you know in a few months how this turns out. "Pine needles make the soil acidic. ", you say. Not so fast my friend. There is plenty of research available that disproves that notion. Yes pine needles do carry an acidic Ph when they are green and on the tree. However, Once they fall to the ground and turn brown they are at or close to neutral Ph. 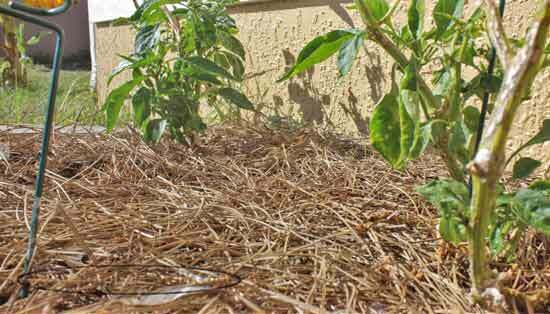 What gave us the idea to use pine straw as mulch was when we came across a video from our friends over at "Deep South Homestead". He used the same material in his strawberry beds and we thought if it works for strawberries then it can't hurt for bell peppers. (We were also just a little bit envious of their wonderful strawberry grow beds). Something I found interesting was when Danny shared that strawberries got their name because farmers would put straw around them so they would't develop mold and rot. We certainly have learned that lesson the hard way. You can watch their accomplishments using pine mulch below and don't forget to check out their YouTube channel as well. Here's to hoping we can salvage a few plants from Hurricane Matthew and the Florida Heat. This year we are working on growing red, yellow and orange bell peppers and will offer updates in the coming weeks. Good luck with your DIY gardening endeavors! I hope you enjoyed today's featured project and hope you will return everyday through the month of November for more projects that make us thankful for DIY.